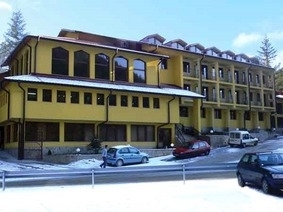 Balkan Hotel in Chiflik Spa and Wellness Resort in the Balkan Mountain Range, Bulgaria. Location: Balkan Hotel is situated in Chiflik village in the Balkan Mountain Range. Accommodation: The Balkan Hotel offers 160 beds in 59 double rooms and 8 apartments with luxurious furnishing - TV, bathrooms with shower or tub, terraces, safe. Wine & Dine: Enjoy tasteful local specialties and international cuisine dishes in luxurious two levels restaurant with 160 places. The hotel also features a lounge bar and a pool-bar in the summer. SPA centre: The hotel features outdoor swimming pool with children section and Jacuzzi situated in the hotel's garden. They are with hot mineral water with temperatures 15°C, 35°C and 42°C in different sections. The swimming pool is used in the winter, as well. At guests' disposal are steam bath, Turkish bath, massage cabinet, sauna. Conference centre:Hotel Balkan offers business facilities for your meetings, conference or events. The conference hall is for 120 people with multimedia equipment. The conference centre offers a business hall for 30 seats and a hall for 15 seats, as well. Coffee breaks, parties, show programs and excursions are also organized. Sport and leisure: The region around the Chiflika village extends huge potentials for exploitation of tourism, SPA (Chiflik village and Shipkovo village), skiing (Beklemeto), swimming and rowing (Chiflik, Shipkovo and Goljama Zheljazna villages), walking, mountaineering, mountain biking, as well as pottery and other native crafts occupations (Oreshak village). At guests' disposal is parking with video monitoring.